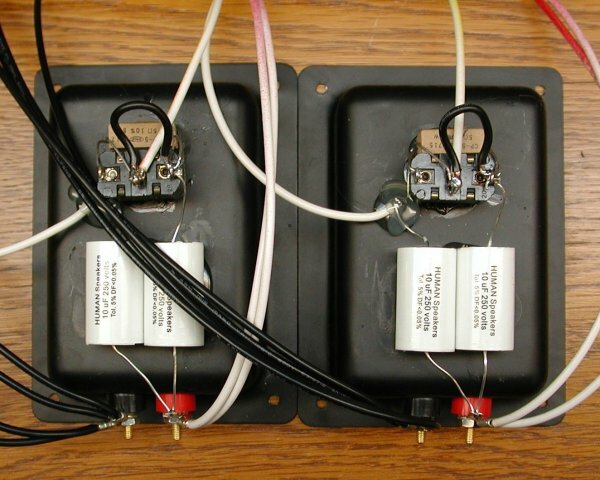 The spring clip terminals on the back are awful: they are awkward to use, only accept wire up to about 18 AWG, and often make a poor electrical connection. 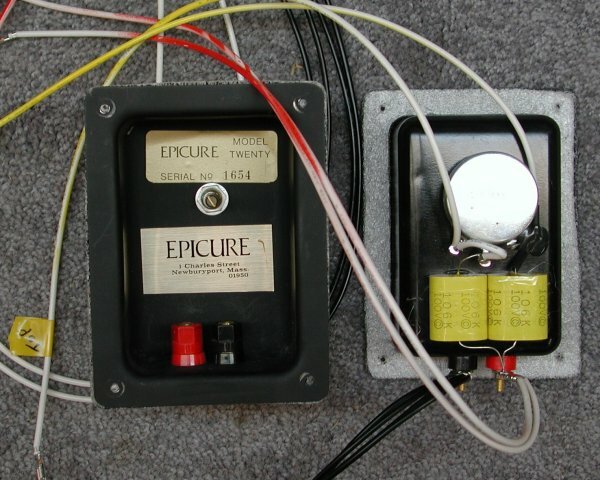 In the case of the Epicure 20 and 20+, binding posts were used, but they only accommodate 16 AWG wire at best. The tweeter level switch or control is prone to corrosion and poor contact quality. The ACC 004 H is a complete assembly I build on your original terminal cup to remedy all these issues. I replace the old binding posts with a pair of gold-plated, color-coded five-way binding posts securely attached on standard 3/4" centers. These will easily accomodate up to 10 AWG wire in the hole through the posts, along with several other connection methods. The crossover capacitors are my high-quality film units, with vanishingly low deviation from the ideal impedance curve, and the internal wires are color-coded 16 AWG oxygen-free copper with connectors that match the terminals on the drivers. I normally build it in the "4 ohm" mode (parallel), and bypass (but leave in place) the tweeter level control or switch. If you want the ability to cut a wire and re-introduce the level control, it is $5 more for the potentiometer version and $10 more for the switch version. You will have to remove them from the cabinets and send them to me. To do this, first remove all the woofers and tweeters from your speakers and set aside. Don't worry about keeping track of the old wire colors, as the new/rebuilt units will have clear coding and instructions. Do be sure you can identify the polarity (plus and minus terminals) of each driver. Unscrew the terminal cup, and pull it out from the rear. This may be awkward - the binding post shafts will get in your way, and you will likely have to use gentle force to angle and push the cup out. Keep in mind that once upon a time, Epicure installed this cup with those posts in place, so it is "possible" to extricate them, if a little difficult. Then just pack them up carefully, enclose a note with all your contact information, and send them to me.